After your free 30-day trial period expires you can activate paid subscription. 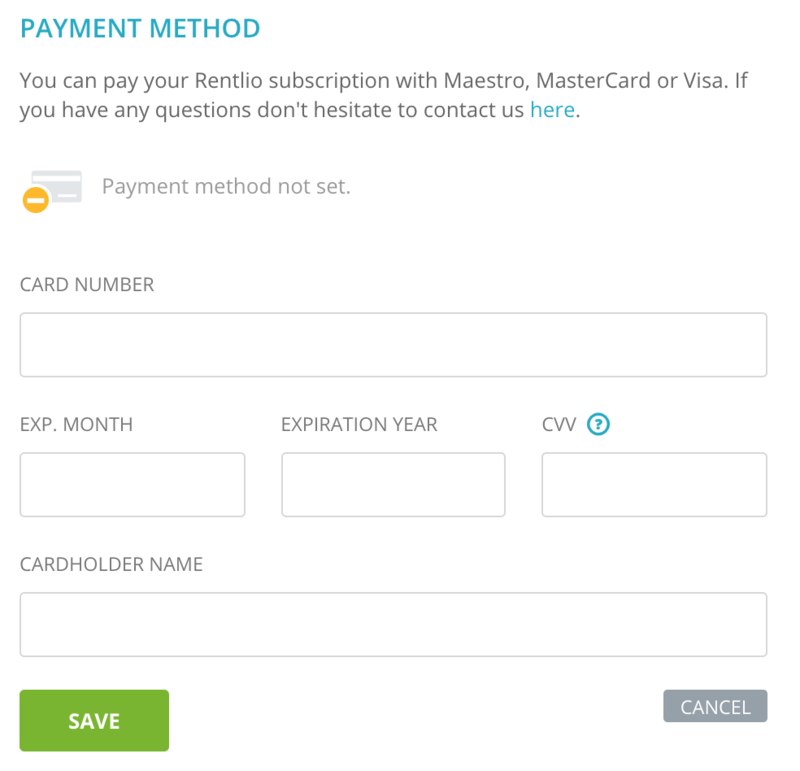 Rentlio subscription is charged monthly via credit/debit card (we accept Visa, MasterCard or Maestro). All you have to do is enter your credit card details to Rentlio and activate your subscription. After that you will be charged automatically each month. Par example, if you activate your subscription on 15th day of the month we will charge your card automatically next month on 15th as well. The remaining days of your free trial can be checked on top right part of Rentlio. Do note that you can activate your subscription even before the trial period ends. By hovering over the remaining days of your trial period (top right part) a new button "Activate subscription" will appear. Click on it. In order to activate your subscription you have to set method of payment and enter your details in Account Settings -> Owner data. Please note that it is extremely important to carefully fill out this data as this information will be displayed on the invoices Rentlio issues to you. If you rent your property as a private owner please only fill out Owner data, and if you have a registered company please fill out Company data along with correct VAT ID number. Important note: VAT is not included in our rates, and will be calculated automatically once you set your country of residence. In case some information is missing you won't be able to activate the subscription. On top right click on your initials (blue circle) then select Account Settings. On that screen select Owner data. On right side there is Payment method. Please click on Set and enter your credit card details. Please note that all fields are mandatory and have to be filled out correctly. After filling out your credit card details (and saving them) all you have to do is click on Subscription and click on Activate subscription. After activation, your subscription will be charged monthly on that day (remember, if you activate subscription on 15th of the month, all future charges will be on 15th as well). All invoices are immediately available for download in Invoices tab. If for some reason you decide to cancel your Rentlio subscription you can do it by clicking on Cancel subscription on Subscription tab.